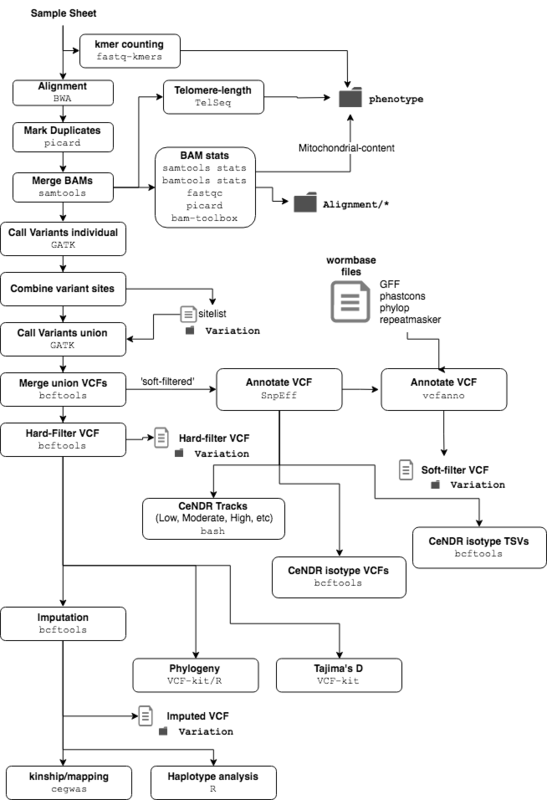 The wi-nf pipeline aligns, calls variants, and performs analysis from wild isolate sequence data. The output of the wi-nf pipeline can be uploaded to google storage as a new release for the CeNDR website. andersenlab/wi-nf is the docker image used within the wi-nf pipeline. If Quest ever supports singularity, it can be converted to a singularity image and used with Nextflow. vcf-kit - A python 2.7.14 environment with vcf-kit and cyvcf installed. multiqc - A python 3.6.0 environment with multiqc installed. The nextflow.config file included with this pipeline contains three profiles. These set up the environment for testing local development, testing on Quest, and running the pipeline on Quest. local - Used for local development. Uses the docker container. quest_debug - Runs a small subset of available test data. Should complete within a couple of hours. For testing/diagnosing issues on Quest. quest - Runs the entire dataset. When running locally, the pipeline will run using the andersenlab/wi-nf docker image. You must have docker installed. When running on Quest, you should first run the quest debug profile. The Quest debug profile will use a test dataset and sample sheet which runs much faster and will encounter errors much sooner should they need to be fixed. If the debug dataset runs to completion it is likely that the full dataset will as well. Most configuration is handled using the -profile flag and nextflow.config; If you want to fine tune things you can use the options below. The number of cores to use during alignments and variant calling. A directory in which to output results. By default it will be WI-YYYY-MM-DD where YYYY-MM-DD is todays date. When running the wi-nf pipeline you must provide a sample sheet that tells it where fastqs are and which samples group into isotypes. By default, this is the sample sheet in the base of the wi-nf repo (SM_sample_sheet.tsv), but can be specified using --fqs if an alternative is required. The sample sheet provides information on the isotype, fastq_pairs, library, location of fastqs, and sequencing folder. More information on the sample sheet and adding new sequence data in the Sample sheet section. A prefix path for FASTQs defined in a sample sheet. The sample sheet designed for usage on Quest (SM_sample_sheet.tsv) uses absolute paths so no FASTQ prefix is necessary. Additionally, there is no need to set this option as it is set for you when using the -profile flag. This option is only necessary (maybe) with a custom dataset where you are not using absolute paths to reference FASTQs. A directory for storing temporary data. The sample sheet defines which FASTQs belong to which isotypes, set FASTQ IDs, library, and more. The sample sheet is constructed using the scripts/construct_SM_sheet.sh script. When new sequence data is added, this needs to be modified to add information about the new FASTQs. Updates to this script should be committed to the repo. You have to assign isotypes using the concordance script before they can be processed using wi-nf. When you run the scripts/construct_SM_sheet.sh, it will output the SM_Sample_sheet.tsv file in the base of the repo. You should carefully examine the diff of this file using Git to ensure it is modifying the sample sheet correctly. Errors can be disasterous. Note that the output uses absolute paths to FASTQ files. Notice that the file does not include a header. The table with corresponding columns looks like this. isotype - The name of the isotype. It is used to group FASTQ-pairs into BAMs which are treated as individuals. fastq_pair_id - This must be unique identifier for all individual FASTQ pairs. There is (unfortunately) no standard for this. library - A name identifying the DNA library. If the FASTQ-pairs for a strain were sequenced using different library preps they should be assigned different library names. Likewise, if they were the same DNA library they should have the same library name. Keep in mind that within an isotype the library names for each strain must be independent. fastq-1-path - The absolute path of the first fastq. fastq-2-path - The absolute path of the second fastq. A summary of the nextflow run. isotype_bam_idxstats.tsv - A summary of mapped and unmapped reads by sample. isotype_coverage.tsv - Simple coverage at the sample level. This directory contains files that integrate with the genome browser on CeDNR. This directory contains tsv's that are used to show where variants are in CeNDR. This direcoty contains the VCFs of isotypes. MT_content.tsv - Mitochondrial content (MtDNA cov / Nuclear cov). kmers.tsv - 6-mers for each isotype. telseq.tsv - Telomere length for each isotype ~ split out by read group. WI. (date).tajima.bed.gz - Tajima's D bedfile for use on the report viewer of CeNDR. WI. (date).tajima.bed.gz.tbi - Tajima's D index. trees/ - Phylogenetic trees for each chromosome and the entire genome. multiqc.html - A comprehensive report of the sequencing run. (date).LOW.bed.gz(+.tbi) - LOW effect mutations bed track and index. (date).MODERATE.bed.gz(+.tbi) - MODERATE effect mutations bed track and index. (date).HIGH.bed.gz(+.tbi) - HIGH effect mutations bed track and index. (date).MODIFIER.bed.gz(+.tbi) - MODERATE effect mutations bed track and index. phastcons.bed.gz(+.tbi) - Phastcons bed track and index. sitelist.tsv.gz(+.tbi) - Union of all sites identified in original SNV variant calling round.